The Tuesday bird walk went to the Top Bridge Trail in Parksville. The morning started out very windy with light rain showers. But turned sunny with calm winds making for a very pleasant morning of birding. We were greeted with the songs of Chipping Sparrow at the start of the walk and throughout the morning. 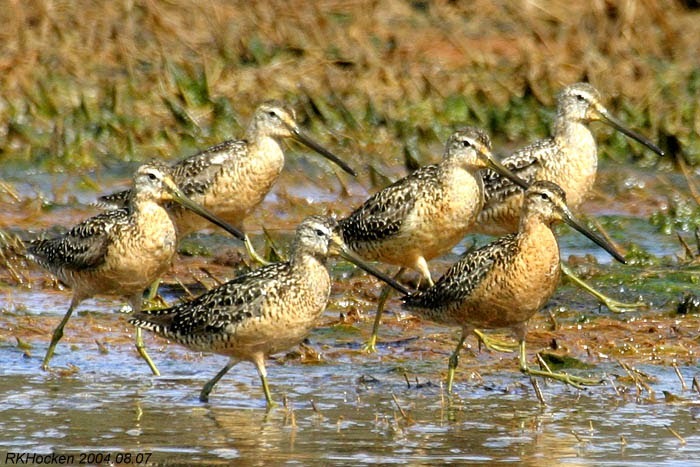 Three Long-billed Dowitchers flew low over overhead giving us great views. We saw Turkey Vultures and Bald Eagles fly overhead during the morning. Orange-crowned Warblers, Yellow-rumped Warblers Black-throated Gray Warblers, Townsend’s Warblers and a Yellow Warbler sang and were seen during the walk. 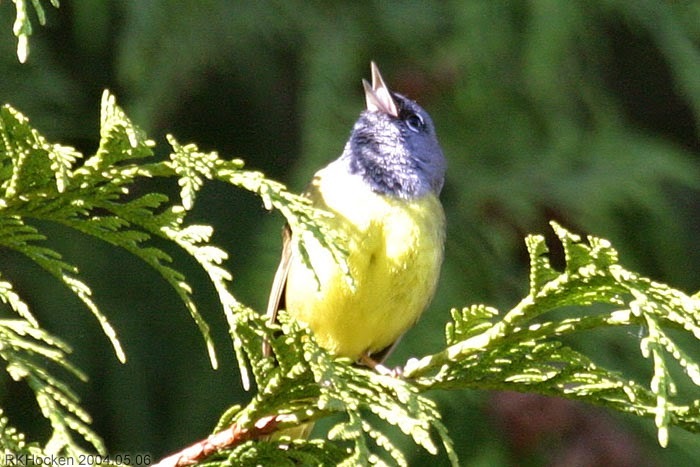 We heard a MacGillivray's Warbler sing near the ponds. 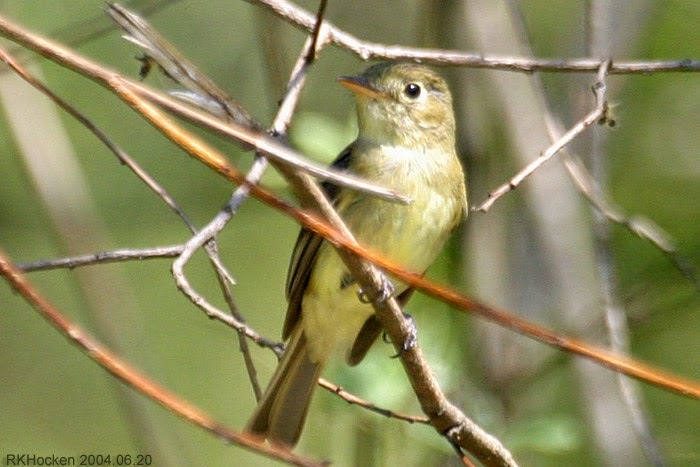 Pacific-slope Flycatchers and Warbling Vireos were often heard during the walk. Four American Goldfinch put on a great show singing and flying close overhead. 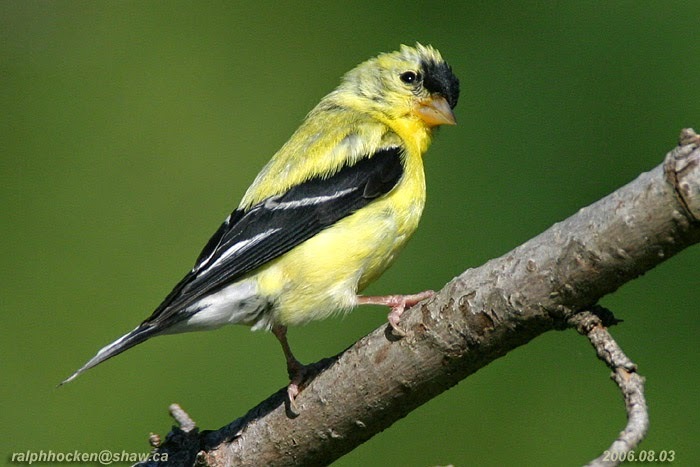 American Goldfinch: Ralph Hocken Photo. The Tuesday on May 05, 2015 will be going to the Plummer Road side of the Englishman River Estuary in Parksville. American Avocet was seen this morning April 27, 2015 at the Little Qualicum River Estuary just off Surfside Drive in Qualicum Beach. The Avocet was feeding with Green-wing Teal and Western Sandpipers on the estuary. The Sunday bird walk went to West Buttertubs Marsh in Nanaimo.. The morning was cloudy with a breeze. The highlights included seeing many flocks of Northern Rough-wing Swallows, Violet-green Swallows and Tree Swallows flying low over the meadows, giving us close views. We heard Yellow Warblers and Pacific-slope Flycatchers singing during the morning. 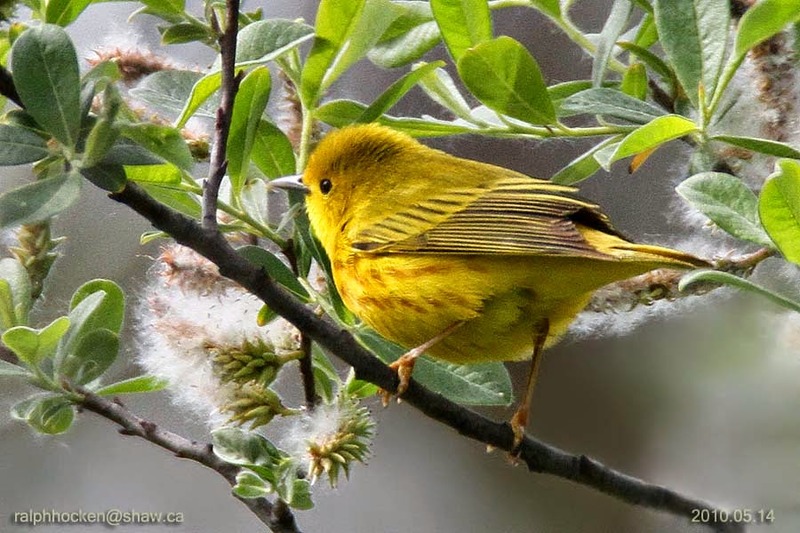 Yellow Warbler: Ralph Hocken Photo. 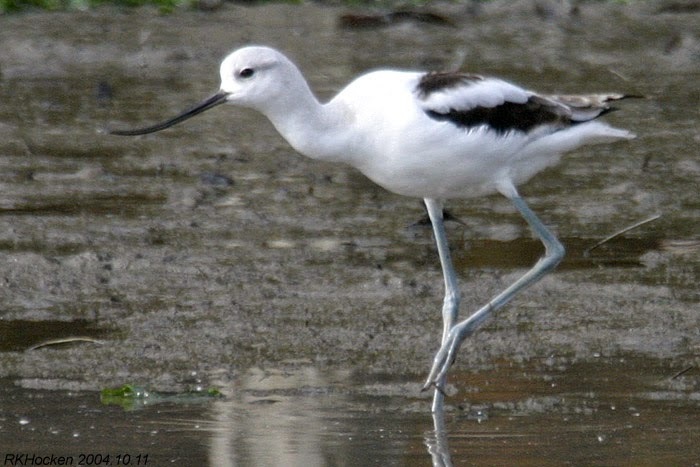 An American Avocet was seen on the mud flats on the Plummer Road side of the Englishman River in Parksville. American Avocet: John Purves Photo. The Tuesday bird walk went to Moorcroft Regional Park in Nanoose Bay. The morning was cloudy and cool with a strong wind off the Strait of Georgia. A Red-throated Loon flew up the strait—a very unusual sighting for this area. Two Marbled Murrelet were seen just offshore giving us great looks. 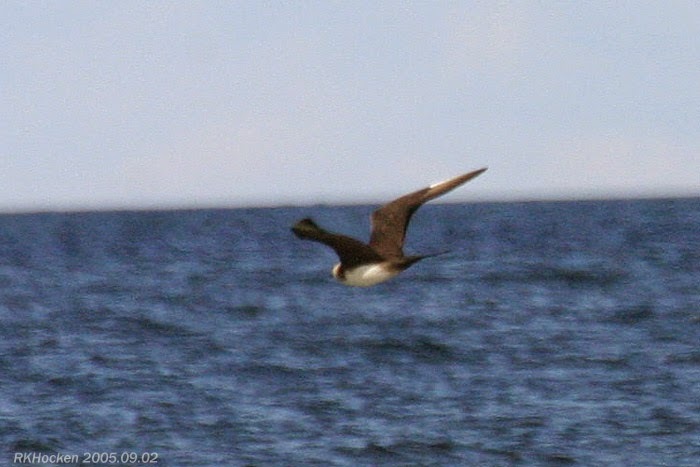 A very fast Parasitic Jaeger flew up the Strait just above the water. A Common Murre and a Pigeon Guillemot were spotted further offshore. We heard Pacific-slope Flycatchers singing during the walk. We saw and heard many Orange-crowned Warblers, Yellow-rumped Warblers, Townsend’s Warblers and Black-throated Grey Warblers throughout the morning. Parasitic Jaeger: Ralph Hocken Photo. The Tuesday bird walk on April 28, 2015 will be going to the Top Bridge Trail in Parksville. Arrowsmith Naturalists meet at Knox United Church in Parksville. Doors open at 7 pm. Presentation on Ecological Reserves by Erica McClaren from BC Parks at 7.30. The Tuesday bird walk on April 28, 2015 will be going to The top Bridge Trail in Parksville. Meet at the Parksville Community Park playground parking lot at 9 a.m. or at the parking alone Indrustrial Way in Parksville at about 9:10 a.m. The Sunday bird walk on Sunday, May 03 will be going to the Bowen park in Nanaimo. Meet at the Birdstore at 9:00 a.m. or at the main parking lot near the Bowing Green at Bowen Park at about 9:15 a.m.
A must read for those of us who live along the Strait of Georgia. An American Avocet was seen this morning on the mud flats on the Plummer Road side of the Englishman River Estuary in Parksville. The bird was spotted at about 7:30 a.m. this morning. Also seen from the viewing platform on the Shelly Road side of the River. It was seen flying away from the Plummer Road at about 8:45 a.m. towards the Shelly Road side. 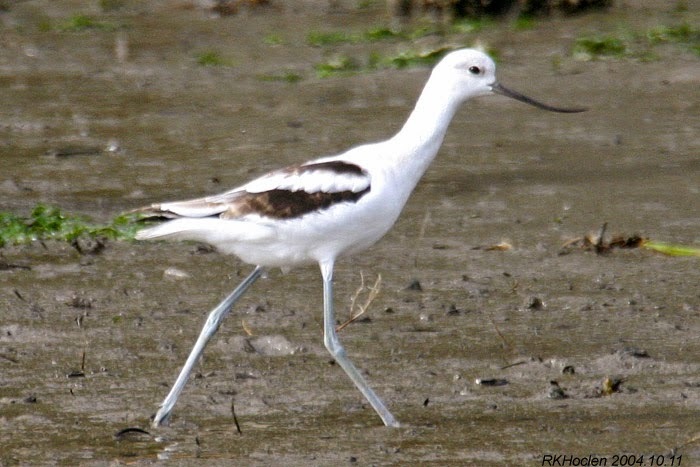 American Avocet: Ralph Hocken Photo. The Tuesday bird walk went to Moorcroft Regional Park in Nanoose Bay. The morning was cloudy and cool with a strong wind off the Strait of Georgia. A Red-throated Loon flew up the strait—a very unusual sighting for this area. Two Marbled Murrelet were seen just offshore giving us great looks. A very fast Parasitic Jaeger flew up the Strait just above the water. A Common Murre and a Pigeon Guillemot were spotted further offshore. We heard Pacific-slope Flycatchers singing during the walk. We saw and heard many Orange-crowned Warblers, Yellow-rumped Warblers,Townsend’s Warblers and Black-throated Grey Warblers throughout the morning. The Sunday bird walk went to Legacy Marsh in upper Lantzville. The morning was sunny with a breeze. The highlights included seeing a Swamp on the edge of the marsh not far from us. The Swamp Sparrow is a rare bird for this area. We heard a Cassin's Vireo, Orange-crowned Warblers, Many Common Yellowthroat, Black-throated Grey Warblers and Yellow-rumped Warblers throughout the morning. A Red-tail Hawk and a Cooper’s Hawk flew overhead. 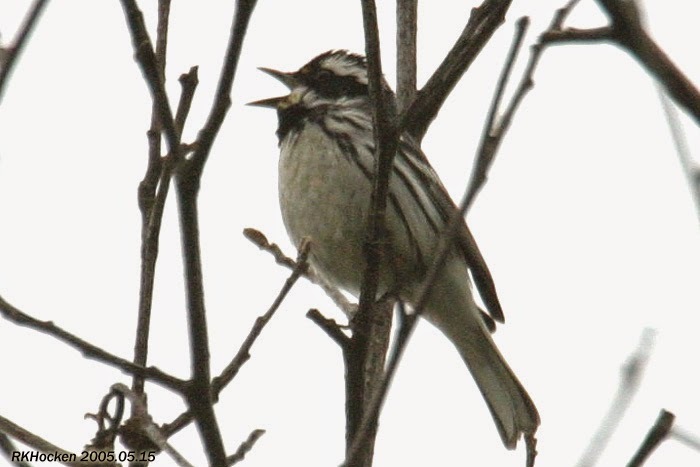 Black-throated Gray Warbler: Ralph Hocken Photo. A Yellow-headed Blackbird was seen at Buttertubs Marsh in Nanaimo. 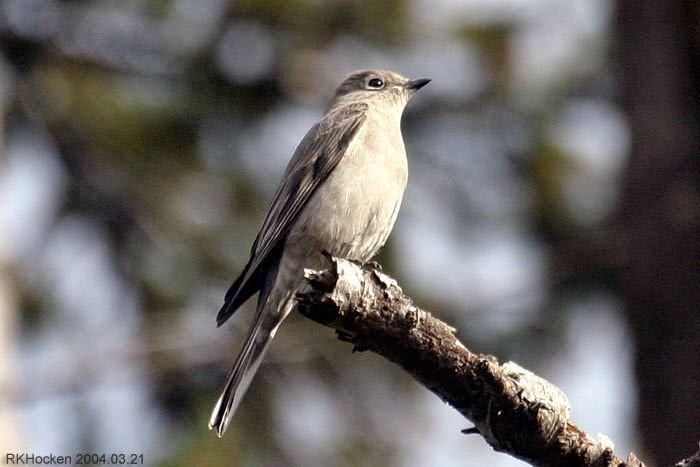 Two Townsend’s Solitaire’s were seen on Little Mountain near Parksville. 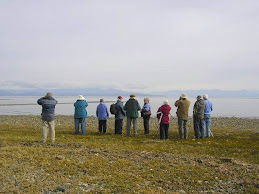 The Tuesday bird walk went to the Shelly Road side of the Englishman River in Parksville. The morning was sunny with a strong wind off the Strait of Georgia but it was very calm in the forest and meadows. As we started the walk we spotted a Hermit Thrush feeding along the trail just in front of us. The birding got better as the morning went on. A Townsend’s Warbler was singing and feeding high up in a big leaf maple tree. He was soon joined by a Yellow-rumped Warbler, a Ruby-crowned Kinglet and an Orange-crowned Warbler. An American Kestrel was perched on a snag and we watched as he flew and hunted over the meadow. We were entertained as he hovered and flew over the meadow looking for prey. 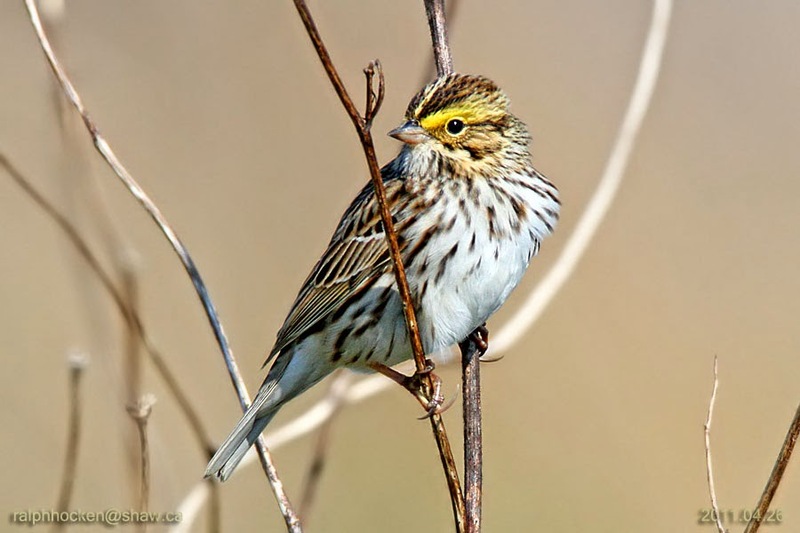 We spotted a Savannah Sparrow perched on a bush close to the shoreline. A Snow Goose and two Greater White-fronted Geese were feeding in the meadow near the R.V. Park. A Townsend’s Solitaire perched on a short bush along the trail giving us great looks. We watched a Red-breasted Sapsucker making a nest hole in a tall snag . He would peck for a while and then go into it to see if it was big enough. We left before he accomplished that! A Northern Flicker was drilling into a tree for a nest on another snag further on in the forest. Spring is here!! Townsend’s Solitaire: Ralph Hocken Photo. A flock of Sandhill Cranes were seen flying up the Alberni Inlet in Port Alberni. The Tuesday bird walk on April 21, 2015 will be going to the Moorcroft Regional Park in Nanoose Bay. Meet at the Parksville Community Park playground parking lot at 9 a.m. or at the parking lot at Moorecroft off Stewart Road (look for the Moorcroft sign on Stewart Road near Dolphin) at about 9:20 a.m. The Sunday bird walk on Sunday, April 26 will be going to the West Buttertubs Marsh Nanaimo. Meet at the Birdstore at 9:00 a.m. or at the parking lot off Jingle Pot Road at Buttertubs Marsh (wear rubber boots it may be wet) at about 9:15 a.m.